Helps increase stamina, strengthen resistance and reduce stress. Regenerate your body with Sunrider today! I play competitive league tennis at the USTA 4.5 level. A few years back, I was playing in a summer tennis league and my team was in first place. We were down to the last match of the season which would determine if we placed first in Utah and go on to the Inter-mountain Sectional Tournament. My doubles match was the last match that would determine the outcome. That day the temperature was over 100 degrees and it was even hotter on the tennis court. My partner and I had split sets in the match and had been playing for over two and a half hours. We had a break before starting the third set. My partner (a personal fitness trainer) was struggling and didn’t think she could continue. I said “Do you trust me?” She hesitated a moment and then said, “Yes, I trust you.” I then gave her Sunrise, SportCaps, Fortune Delight with Electrosport, and a SunBar– all of which I had used throughout the match and was feeling great. Our opponents were younger and fitter and had commented on the fact that they love playing in the heat. We started the third set and were down 2-4 When my partner started moving better and playing with more intensity. We proceeded to come back and win the third set 7-5. Our match lasted over three hours and forty-five minutes in over100-degree heat. I was 51 years of age and my partner was in her 30s. Our team went on to win for Utah, win at inter-mountain Sectionals, and go on to Nationals in Hawaii that year. 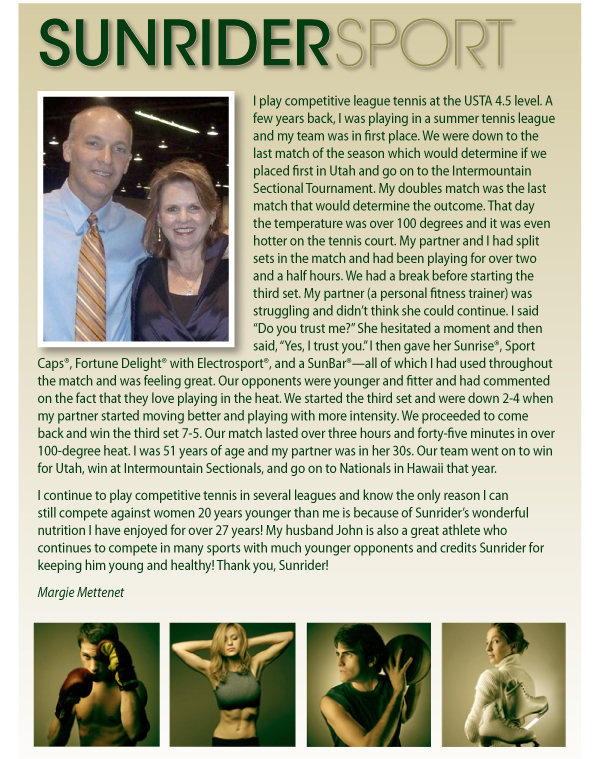 I continue to play competitive tennis in several leagues and know the only reason I can still compete against women 20 years younger than me is because of Sunrider’s wonderful nutrition I have enjoyed for over 27 years! My husband John is also a great athlete who continues to compete in many sports with much younger opponents and credits Sunrider for keeping him young and healthy! Thank you, Sunrider! 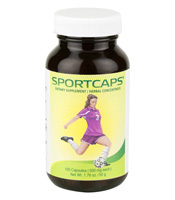 Be the first to review “SPORTCAPS” Click here to cancel reply.